Thanks to all who attended. An excellent turn out and good weather. Please could cubs and scouts meet in the village hall car park by 9.40am to parade to St Mary’s Church for the 10am service. 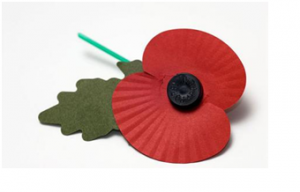 Cubs and Scouts will need to be in full uniform and correct uniform with school shoes and a wearing a poppy. They will also need money for the collection. Everyone is welcome to join us for the service. 18 cubs have just returned from Caddihoe where they attended the District Camp last weekend along with other cub packs from the district. 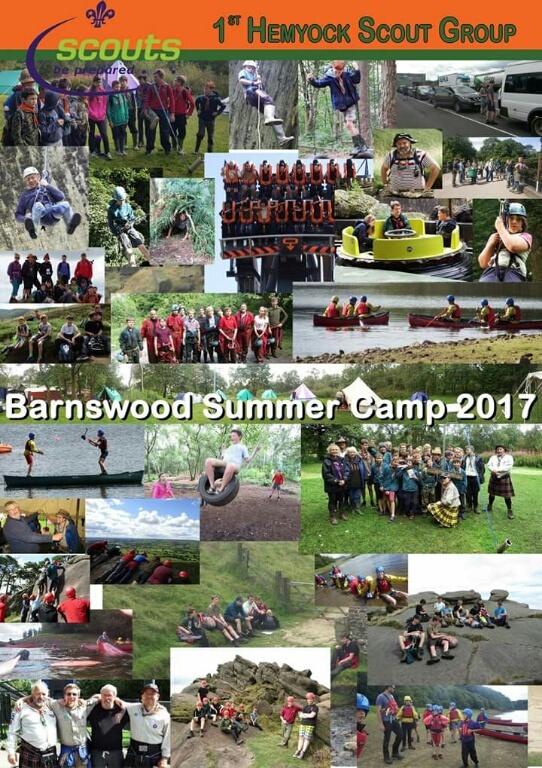 A brilliant weekend was had by all, with the theme of Team Work the Cubs took part in many activities including Ballistas, Rocket Launching, Trading Post Challenge, Shelter Building, Blindfold Trail and Team Games. They all also had the chance to cool down with a great waterfight where the leader’s got caught too! Sunday morning all the cubs took part in a cross country run, all cheering each other on before having a BBQ lunch and heading home very tired after a great weekend making new friends and working as a team. 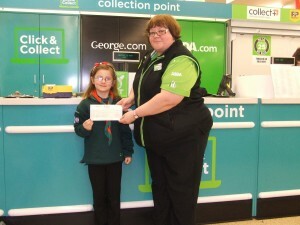 Hemyock Scouts have been chosen as one of three charities for Waitrose Wellington Community Matters for May. Please support us by putting your token in our box, the more tokens we get, the bigger the donation we will receive. 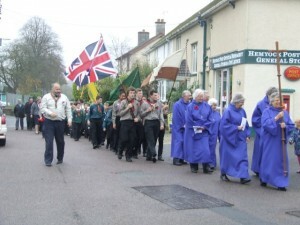 Parading from the Parish Hall at 11.00am to St Mary’s Church for a service. 12.30 at The Garages, Millhayes. Lilly picking up a cheque on behalf of Hemyock Scout Group from Wellington Asda’s Community Life programme Chosen by you given by us. The money will be put towards the Explorers, Scouts and Cubs trip to “Run 2 The Fun”. This is Devon Scouts International Jamboree at Mount Edgcombe Cornwall. Over a thousand members all camping together. 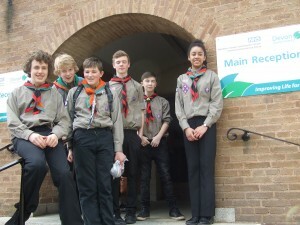 Hemyock Chief Scout Gold Award achievers get their reward at County Hall. After several years hard work six of the ten Scouts received their official presentation. Last Sunday (22nd March) 8 Hemyock Cubs took part in the County swimming gala at Middlemoor in Exeter. They all swam very well and came 4th overall in the county. The certificates were awarded by the Chief Constable of Devon and Cornwall Police, Shaun Sawyer.